To investigate the relationship between a self-reported learning disability or attention deficit hyperactivity disorder (ADHD), self-reported concussion history, and future diagnosed concussions. Interscholastic athletes (N = 8,814) participated. Relevant participant demographic information was collected during baseline testing through the Immediate Post-Concussion Assessment and Cognitive Test (ImPACT Applications, Inc., San Diego, CA). Independent variables included a self-reported learning disability and ADHD. Dependent variables included the self-reported concussion history and subsequent diagnosed concussions. Relationships were evaluated using relative risk ratios (P < .05). A total of 158 participants (1.8%) indicated having a learning disability, 375 (4.3%) noted ADHD, and 1,583 (18.0%) self-reported a concussion history. During this study, 632 concussions were diagnosed. 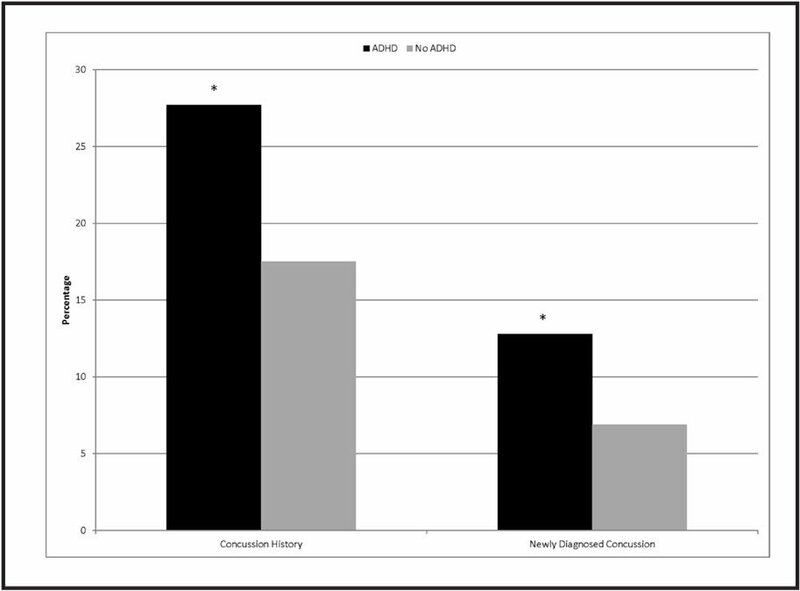 Learning disabilities and ADHD both were associated with an increased concussion history (P < .001) and diagnosed concussions (P < .001). These findings suggest that athletes with a self-reported learning disability and/or ADHD may be at increased risk for concussions. Athletic trainers should consider these conditions as risk factors and attempt to ensure that these and other comorbid factors are identified. Sport-related concussions are a significant health care concern among active individuals. Estimates suggest that 1.1 to 1.9 million concussions occur annually from participation in sports and recreational activities.1 Modifying factors have been suggested that may predispose an individual to sustaining a concussion or result in a prolonged recovery following injury.2 Two putative factors are a learning disability and attention deficit hyperactivity disorder (ADHD). Both learning disabilities and ADHD are prevalent disorders affecting 1 in 6 children in the United States.3 Learning disabilities can affect auditory-linguistic abilities, visual abilities, memory, processing speed, cognitive efficiency, and reasoning,4 whereas ADHD is characterized by inattention, hyperactivity, difficulty concentrating, and, occasionally, poor motor skills, balance, and coordination.5 The symptoms associated with concussion include those commonly associated with both learning disabilities and ADHD and may create confusion in diagnosing concussion, administering and interpreting neurocognitive assessments, and the academic management of patients following concussion. Furthermore, there is some speculation that these conditions may result in a prolonged recovery; thus, understanding their prevalence and documenting their presence during the pre-participation examination is important. Although these studies have provided evidence of a higher prevalence of concussion history compared to individuals without the condition, they have been retrospective in nature and have not investigated whether athletes who self-report a learning disability or ADHD are at greater risk for subsequent concussions, investigated prospectively. As such, we sought to retrospectively investigate the relationship between self-reported learning disabilities and ADHD and self-reported concussion history, as well as to prospectively assess the relationship between these disorders and the probability of sustaining a medically diagnosed concussion. Data for this study were collected prospectively as part of a larger investigation of concussion recovery and quality of life17,18 in which participants completed a baseline assessment battery and athletic trainers completed post-injury assessments at specified time points until patients returned to full participation. For this particular research question, a secondary analysis of the larger study database was performed. A convenience sample of 8,814 adolescents from local high schools who competed in interscholastic contact sports (2,809 females, 6,002 males, mean age = 15.7 ± 1.2 years, mean grade level = 9.3 ± 1.1) were recruited for participation. Participants were recruited from 18 secondary schools in Arizona enrolled in a larger, prospective investigation of concussion effects.17 The majority of participants noted their primary sport as football (37.6%), followed by soccer (15.9%), basketball (13.7%), volleyball (10.6%), baseball (6.8%), and wrestling (6.5%), with other sports being represented by fewer than 5% of participants. All participants had completed the state-required pre-participation examination and had been cleared to participate in contact sports by a physician. All participants who completed the baseline test battery were included in this analysis. A waiver of consent was granted by A. T. Still University's Institutional Review Board, who approved the study. As part of the larger investigation, all participants completed the Immediate Post-Concussion Assessment and Cognitive Test (ImPACT) (ImPACT Applications, Inc., San Diego, CA) as part of a baseline assessment battery prior to the start of their athletic season. ImPACT testing has been deemed a valid and reliable concussion assessment tool.19 The ImPACT test sessions were proctored by members of the research team and participants were tested in groups of no more than 20. Within the baseline demographic section of the ImPACT test, participants self-reported whether they had been diagnosed as having a learning disability or ADHD and self-reported whether they had sustained any prior concussions. For the purposes of the analyses reported in this study, only ImPACT demographics were used and no other ImPACT testing variables were included. Descriptive statistics were calculated for demographic data, self-reported learning disabilities and ADHD, self-reported concussion history, and future concussion diagnosis using SPSS software (version 24; IBM Corporation, Armonk, NY). Independent variables included self-reported learning disabilities or ADHD, as determined from the ImPACT demographic section at baseline. Dependent variables included the self-reported concussion history, as reported in the ImPACT demographic section at baseline, and any subsequent concussion diagnosed by an athletic trainer that resulted in the participant completing at least one post-injury ImPACT test. Relative risk ratios (RRs) and 95% confidence intervals (CIs) were calculated to quantify the relationship between independent and dependent variables (P < .05). A total of 1,583 (18.0%) participants self-reported a concussion history. Further, 158 participants (1.8%) self-reported learning disabilities and 375 (4.3%) self-reported ADHD. Forty-six participants (0.5%) reported both a learning disability and ADHD. Over the course of this 2-year study, 632 newly diagnosed concussions (incidence = 7.2%) were identified. 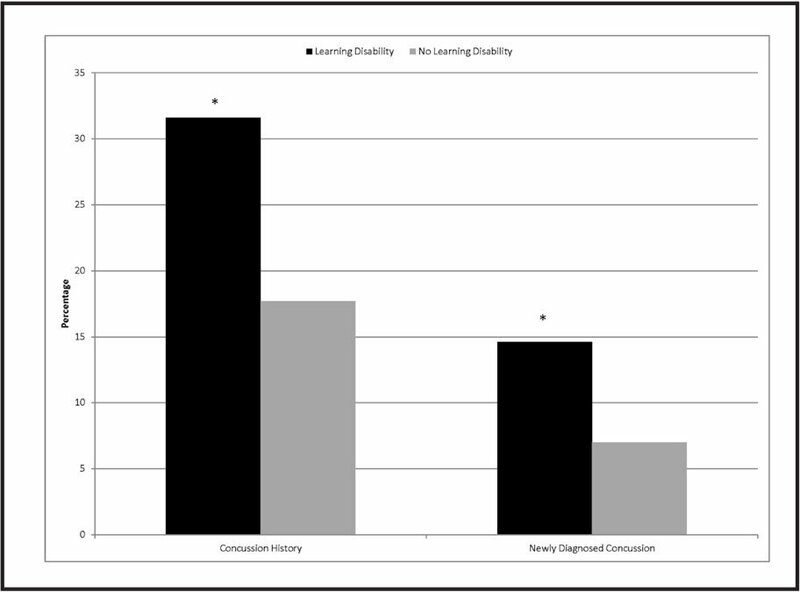 Self-reported learning disability was positively associated with both a self-reported concussion history (RR = 1.77; 95% CI: 1.27, 2.45; P < .001) and newly diagnosed concussions (RR = 1.91; 95% CI: 1.44, 2.55; P < .001) (Figure 1). Participants with self-reported ADHD were also more likely to self-report a concussion history (RR = 1.61; 95% CI: 1.29, 2.00; P < .001) and sustain a newly diagnosed concussion (RR = 2.13; 95% CI: 1.39, 3.26; P < .001) (Figure 2). Self-reported learning disability and report of prior and newly diagnosed concussions. *Significantly higher (P < .001). Self-reported attention deficit hyperactivity disorder (ADHD) and report of prior and newly diagnosed concussions. *Significantly higher (P < .001). Our findings suggest that athletes with self-reported learning disabilities or ADHD have an increased self-reported concussion history and an increased risk of sustaining future concussions. The results regarding concussion history are similar to those reported in other retrospective studies, adding to the evidence supporting the association between ADHD, learning disabilities, and concussion history.7,11,13,14,16 Perhaps more importantly, we determined that adolescents with self-reported learning disabilities or ADHD were also at increased risk for sustaining a newly diagnosed concussion compared to those who did not self-report these conditions. Our retrospective findings further support the notion that athletes with a developmental condition (learning disability or ADHD) have a higher prevalence of prior concussions. The relative risk of concussion history among our participants with ADHD (RR = 1.61) or a learning disability (RR = 1.77) was slightly lower than in college athletes (RR = 1.81), 14 high school athletes (OR = 1.71),16 and those with ADHD (RR = 2.93) or a learning disability (RR = 2.09) who reported a history of three or more concussions,11 but still demonstrate a higher prevalence of concussion that should be documented during the preseason physical. Previous research has focused on retrospectively exploring concussion history with respect to various comorbid factors, and we are not aware of other studies that have evaluated this prospectively. Our findings suggest that athletes with self-reported learning disabilities or ADHD are twice as likely to sustain a newly diagnosed concussion compared to adolescents without these conditions. This finding suggests that concussion management for patients with a learning disability or ADHD may require additional considerations specific to academic adjustments and a return-to-school plan. Furthermore, interpreting neurocognitive test scores and symptom assessments may be more difficult in these patients due to their developmental condition.3,6,7 Clinicians and schools who have athletes with a learning disability or ADHD should evaluate their concussion management plans to ensure they account for differences that may affect the management of athletes who may be at increased risk for a newly diagnosed concussion. Although baseline testing is not recommended for all athletes,15 it may be useful for individuals with a learning disability or ADHD because existing normative data are not accurate for comparative purposes in patients with a learning disability or ADHD who have sustained a concussion.3,6,7,21 Therefore, clinicians should take this into account when interpreting baseline assessments and making comparisons from baseline to post-injury. Furthermore, information from neurocognitive assessments may be useful in developing a return-to-school plan for patients with a learning disability or ADHD as they recover from a concussion. Research consensus statements and guidelines suggest that a learning disability and ADHD be considered modifying factors for concussion management when proceeding through the return-to-play protocol post-injury.15,21,22 Suffering a concussion may enhance ADHD symptoms,23 which may further complicate management protocols. Modifying factors emphasize the need for clinicians to individualize concussion management protocols and to understand the role of learning disabilities and ADHD both with respect to concussion history and the potential for a newly diagnosed concussion. This study has some limitations. The authors are aware that self-report of a learning disability, ADHD, and concussion history is not perfectly valid or reliable. Having medical confirmation of a learning disability, ADHD, and prior concussions would strengthen studies investigating these conditions as risk factors for concussion. The authors acknowledge that all possible concussions may not have been captured or reported to the research team. Further, although concussion diagnosis was made by either an athletic trainer or team physician, consistency among clinicians is of concern. Future studies should maintain continuity and only have one clinician making the medical diagnosis. This study identified relationships between self-reported learning disabilities and ADHD and concussion history, as well as future diagnosed concussions. It is recommended that clinicians understand that self-reported learning disabilities and ADHD may increase concussion risk. Medical professionals should be mindful of these risk factors and incorporate this information into assessment and management of concussions. Future studies should evaluate other comorbid factors for increased risk of concussion or prolonged recovery following a concussion. Iverson GL, Wojtowicz M, Brooks BL, et al. High school athletes with adhd and learning difficulties have a greater lifetime concussion history [published online ahead of print July 18, 2016]. J Atten Disord. McCrory P, Meeuwisse W, Dvorak J, et al. Consensus statement on concussion in sport: the 5th International Conference on Concussion in Sport held in Berlin, October 2016 [published online ahead of print April 26, 2017]. Br J Sports Med. From A.T. Still University, Mesa, Arizona. Supported by a grant from the National Operating Committee on Standards for Athletic Equipment (NOCSAE).